Marine insurance is a type of insurance that covers the loss or damage of cargo while on the water as well as during transport to and from the port terminals. As you'll read later on there are two types of policies and your coverage will be based upon which policy you purchase. However, your marine insurance policy will cover your vehicle, household goods, or cargo during transport to the port terminal, while it is on the water and upon arrival at the receiving terminal. The insurance will cover damage, loss, fire and breakages depending upon whether you elect all risk insurance or total loss. We can only offer this type of marine insurance if the items are packed by our professional personnel. As you can imagine, this is for quality purposes. This type of policy covers damage and breakages that may occur starting from the day of packing/loading, through transit and delivery to final destination. The policy is valid until the 45th day after your cargo's arrival at the destination port. Think of this coverage as the Rolls Royce of marine insurance coverage. It guarantees that the insurance company will replace any article that is lost or damaged beyond repair with either a like item or a cash settlement. Any cash settlements made will be in the amount of the current market value of the item(s). 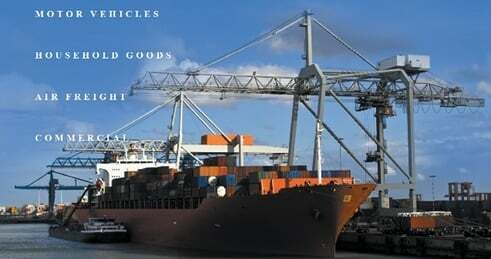 Total loss marine insurance is available to all shipments. It will cover fire, theft or loss only and a total value must be placed on the shipments for coverage purposes. Like the insurance your accustom too, the better the coverage the higher the premium. For all risk, you pay a higher premium. The % rate will vary depending on the deductible you choose. Usually the higher the deductible, the lower the premium. Ask your salesperson to explain all options at time of booking. Although we take every precaution and have over 38 years experience in the shipping industry some things can and do happen from time to time. Remember............the man who built the titanic said it would never sink! Marine insurance is important for the worst case scenario. It gives clients peace of mind during the process so there is one less thing to worry about. As a fully insured, bonded and licensed company, so long as your cargo is in our company owned warehouses and within our possession, it is insured. Your marine insurance comes into effect as soon as your cargo leaves our warehouse for the port terminal. Additionally, it is in effect during ocean transport, at the receiving terminal and up until our partners receive your cargo overseas. At which point, it will be covered under their insurance as all of our partner agents are fully insured. Are there certain items that can't be insured? If you load your car with personal effects we ask that you provide an inventory of these items so that we can declare them on the load plan and your bill of lading. These items can be insure as total loss only.